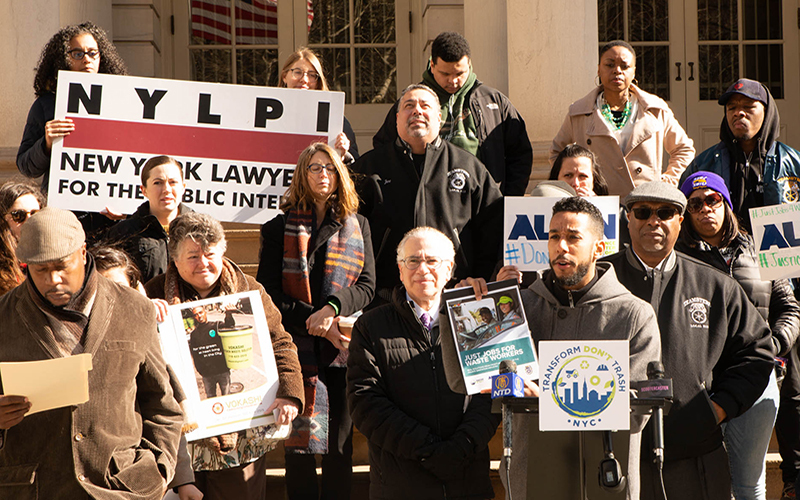 We issued the report this morning at a City Hall Press Conference in partnership with our allies in the Transform Don’t Trash NYC Coalition, and City Council Member Antonio Reynoso. The report is available here in English, and here in Spanish. “The commercial waste industry continues to be one of the hardest and most dangerous industries to work in, but this does not have to be the case, at least not in New York City. The Commercial Waste Zone policy provides a step in the right direction, and we need to ensure we deeply transform this industry, bringing with it safe jobs that are good and sustainable practices. This is a matter of economic justice, environmental justice, and racial justice – for our communities of color who are employed and most directly affected by this industry. I am proud to stand with the Transform Don’t Trash coalition – and especially the workers who have bravely spoken out – in calling for these much needed changes,” said City Council Member Carlos Menchaca. The Transform Don’t Trash NYC coalition is dedicated to transforming New York City’s commer­cial trash industry to reduce waste and pollution, foster clean and healthy communities for all New Yorkers, and create good jobs. Members include the New York City Environmental Justice Alliance (and its member organizations Brooklyn Movement Center, El Puente, the Morningside Heights/West Harlem Sanitation Coalition, Nos Quedamos, THE POINT Community Develop­ment Corporation, UPROSE, and Youth Ministries for Peace and Justice), ALIGN, the Interna­tional Brotherhood of Teamsters Joint Council 16 & Locals 813, 831 (the Uniformed Sanitation­men’s Association), 125, 210, 445, 456, 553, and 812, the Natural Resources Defense Council, and New York Lawyers for the Public Interest. Labor and environmental groups are continuing to push the de Blasio administration to advance a more stringent regulatory reform plan for the commercial waste industry, which collects trash generated by businesses. The groups released a report that makes seven recommendations to strengthen the Department of Sanitation’s waste franchising plan, formally announced in November. Among the recommendations, the report calls for the city to adopt an exclusive zoning plan — where the city would be divided into zones that are serviced by one private waste company. DSNY’s current plan divides the city into 20 zones, which would be serviced by between three to five carters. DSNY is pursuing commercial waste reform in an attempt to improve labor, safety and environmental practices at private waste companies. A recent DSNY study showed that exclusive waste zones will result in a greater reduction in the amount of vehicle miles traveled by garbage trucks and improved diversion rates for recyclables and organics compared to a non-exclusive zone plan. But DSNY officials have said an exclusive zone model would create monopolies, hurting service quality. The report was co-authored by the Alliance for a Greater New York, New York Lawyers for the Public Interest, the Teamsters and Transform Don’t Trash NYC. New York City has the chance to turn private sanitation jobs into great jobs if it supports a seven-point plan to fix the city’s commercial waste system, according to frontline workers from around the U.S. in a new report released by the Transform Don’t Trash NYC coalition. The report features interviews with seven workers in the sanitation industry from around New York and the rest of the country and highlights how waste jobs can be safe and family supporting. Many of the workers began their careers in sanitation working for low-road employers who resisted union organization and endangered worker safety, like Sanitation Salvage, the now shuttered company that tried to cover up the death of off-the-books employee Mouctar Diallo in November 2017. “Some people might think that the workers who sort New Yorkers’ trash don’t deserve good jobs. But this is hard work and important work. New York will not reach our climate goals if not for the work I and my colleagues are doing at Sims. And with our union, we are showing that this can be a good job, too,” said Jessica Yance, crane operator at Sims Municipal Recycling and Teamsters member, in a statement. The workers say there is much to praise in the commercial waste zone plan being finalized this year by the New York City Council and the City of New York Department of Sanitation (DSNY). But they believe the city should structure its plan with “exclusive waste zones,” in which the city would assign one hauler to each commercial zone, holding them to labor, environmental, safety and pricing standards through a competitive bidding system. “Too many companies treat private sanitation workers like the trash they pick up. An exclusive commercial waste zone system presents an opportunity to transform these jobs and guarantee that every sanitation worker in New York has a safe job, fair pay and respect at work,” said Sean Campbell, president of Teamsters Local 813, in a statement. Set standards to create good, safe jobs at recycling, composting and transfer station facilities. “NYC needs good union jobs, NYC needs cleaner, safer trucks and NYC needs safe streets. The commercial waste zone policy is an unprecedented opportunity to tackle these issues in one common-sense reform. An exclusive zone system with high standards will be a win for workers, a win for our environment, a win for our communities and a win for MWBEs and innovators in the waste industry,” said author Justin Wood, director of organizing and strategic Research at New York Lawyers for the Public Interest, in a statement. Advocates want to rein in the deadly private carting industry with a slate of reforms designed to protect workers and make roadways safer — a program that goes much further than the de Blasio administration’s current proposal. The city must assign just one private hauler to each new exclusive commercial waste zone rather than multiple competing companies for business as the mayor has proposed, advocates said Tuesday, as they unveiled a reform plan that seeks to end the dangerous free-for-all of as many as 50 private carting companies picking up trash from just one neighborhood. Council member Antonio Reynoso joined the advocates to demand a safer industry whose drivers have killed at least 20 people since 2016. “We are talking about saving lives,” said Reynoso, the chairman of the Council’s sanitation committee, at City Hall. Last year, the Department of Sanitation put forward a Commercial Waste Zone framework following years of advocacy to fix the deadly industry. The city plan would assign three to five haulers to each of the new zones — but activists say that does not go far enough in reducing the possibility of crashes on the road or preventing tired, overworked employees from getting behind the wheel. The demands for exclusive waste zones with just one hauler per zone is part of a larger seven-point plan outlined in the advocates’ new report, “Just Jobs for Waste Workers,” released on Tuesday. Ensuring that regulators have the tools needed to enforce good practices within the industry, following legislation Council passed earlier this year to crack down on so-called “sham unions” within the business. The city must only award contracts to employers who have a good track record of offering their employees minimum wage, overtime pay, limitations on hours of service, paid sick and family leave, and safety training programs; and on the flip side, penalize companies that violate employees’ rights to choose a union — a scare tactic documented by ProPublica. The city must prioritize hiring and job training for communities that are often excluded from good jobs, especially formerly incarcerated individuals, immigrants, and workers from low-income communities of color that have long been forced to deal with a disproportionate share of garbage truck traffic. Support entrepreneurship and diversity in the recycling and diversion sector through minority and women-owned business enterprises subcontracting requirements and financial support to community-based sustainability efforts. A spokeswoman for the Department of Sanitation said the city’s commercial waste zone plan addresses some of the demands made in the report, although it does not go so far as to support just one hauler per zone. Legislation for reforming the private carting industry is expected this spring, according to Reynoso’s office.